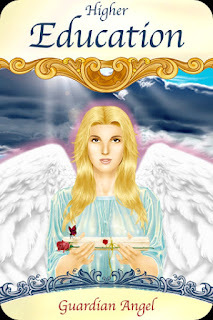 Card of the Day ~Higher Education~ Your angel is guiding you to gain further education, either by attending school or through independent study. Higher education refers to instruction with a spiritual basis, so this is a message for you to study topics that capture your true interests. For instance, if there’s a spiritually based service career that you yearn for, now is the time to begin looking at furthering your knowledge in that area. This may mean attending formal classes, reading books on the topic, or working with a mentor. Give any worries about having enough time, money, or skill to your angel. You’re being pushed to learn more as a result of your prayers for increased fulfillment. Trust that this door is opening for you at the right time, and walk through it with full faith. Begin with simple steps, such as researching various classes on your chosen topic. Even though you may feel that schooling will take time, remember that you’ll be alive and doing something during that time anyway. You may as well use your days wisely by investing in something meaningful. By pursuing higher education, you’ll gain newfound wisdom, higher self-esteem, new friends, and exciting opportunities. Have an abundantly full day! I love you all!